There’s nothing like visiting a developing country to make you realise how lucky you are if you were born in the Western world. When you see people that literally have nothing, it’s kind of difficult to complain about trivial matters like a crappy hostel or feeling ripped off by the last tuk-tuk driver. I felt this more than ever when I visited a Cambodian orphanage, and met a family of children who had lost their mother to a snake bite. They lived in the orphanage but had no possessions besides a few clothes and a bed. Yet they seemed happy enough and played like any other children. It’s hard to care much about how your hair looks today when faced with such scenarios. 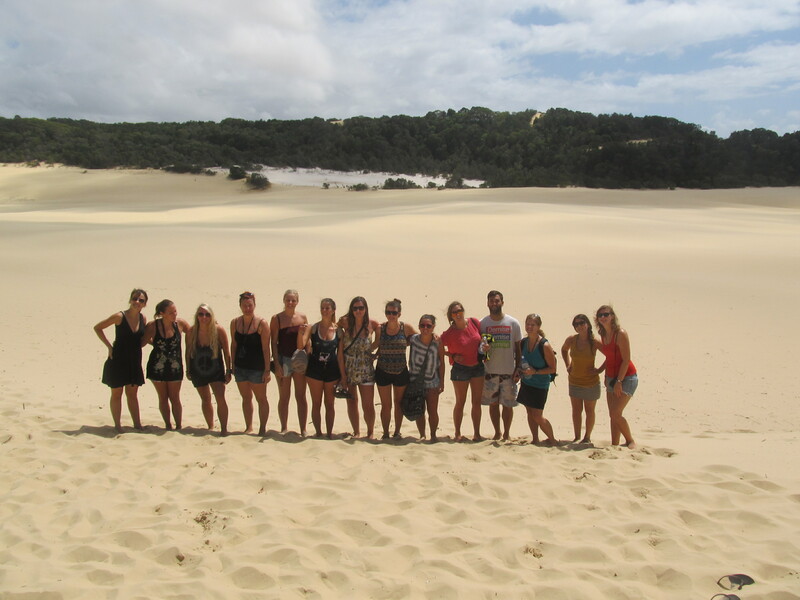 Our wonderful tour group for Fraser Island, Australia. I’ve written before about how the people you meet whilst travelling are often what makes your trip so special. Someone once said to me: “these people you’ve met travelling, you don’t really know them”. This is not true whatsoever. When you meet others on the road the relationships you form are true and real, even if they end up being temporary. You in fact reveal yourself much more readily then you probably ever would in your hometown. I love chatting with the locals when I’m travelling. These people can give you an insight into their local culture and way of life. I’ve had many fascinating conversations with people from all over the planet, and learned a lot from them. Travel is low-maintenance. It has to be – if you live out of a 50 litre backpack there’s no room for fancy clothes, grooming products and all the home comforts you are used to. Which is actually a very liberating thing. I love my travel image. It’s laid-back, natural and relaxed. I never have to worry about what I’m going to wear as I only have about five outfits to choose from anyway. Whenever I’m back among society and not living out of a bag I hope to retain the essence of the simple life. Stuff is just stuff; you don’t really need it to be happy. There’s nothing like visiting a developing country to make you realise how lucky you are if you were born in the Western world. When you see people that literally have nothing, it’s kind of difficult to complain about trivial matters like a crappy hostel or feeling ripped off by the last tuk-tuk driver. I felt this more than ever when I <visited a Cambodian orphanage>, and met a family children who had lost their mother to a snake bite. They lived in the orphanage but had no possessions besides a few clothes and a bed. Yet they seemed happy enough and played like any other children. It’s hard to care much about how your hair looks today when faced with such scenarios. I’ve written before about how the <people you meet whilst travelling> are often what makes your trip so special. Someone once said to me that “these people you’ve met travelling, you don’t really know them”. This is not true whatsoever. When you meet others on the road the relationships you form are true and real, even if they end up being temporary. You in fact reveal your true self much more readily then you probably ever would in your hometown. I also love chatting with the locals when I’m travelling. These people can give you an insight into their local culture and way of life. I’ve had many fascinating conversations with people from all over the planet, and learned a lot from them. 4. Remembering your inner child. Sometimes I feel like life has thrown me one too many curveballs and negative experiences. Sometimes I feel a little jade and cynical. But travel makes me forget all that. Travel makes me feel like a child again. I get this giddy excitement at visiting new places and experiencing things for the first time. When I arrive at a destination I’ve never visited before, I get to be new again. I’m seeing everything for the first time, finding my way around and making friends. I tend to float around in a sense of awe for the first day or two. It helps me remember: the past is irrelevant. All hardened travellers will agree that life on the road often gives you a wonderful sense of achievement. You found the best dim sum in Kuala Lumpur? Congratulations! Figured out how to get from town A to town B via the cheapest transport? Good work! You’ve had the longest, hottest, most uncomfortable bus journey ever but you still end up smiling and enjoying a cold beer at the end of the day? Then you’ve cracked travel. You rose to the challenge, you got what you wanted or to where you needed to be. It’s important to be proud of your successes, however small, while on the road and pat yourself on the back for your general travelling awesome-ness. Although this might seem obvious, there are some people that seem to travel with their eyes closed. They might just be there for the parties in Asia or to lie on a nice beach every day and forget about reality. In my opinion, this isn’t really travel. Travel is supposed to open your eyes and broaden your mind. You should experience new things as often as possible and get as far from your comfort zone as you can. That means absorbing everything around you and learning everything you can from each place you visit. I use every long journey whilst travelling to reflect on where I’ve just been and what I found out while I was there – I’m revealing my inner-hippy here. For me, travel without education just isn’t travel. Sometimes I feel like life has thrown me one too many curveballs and negative experiences. Sometimes I feel a little jaded and cynical. But travel makes me forget all that. Travel makes me feel like a child again. I get this giddy excitement at visiting new places and experiencing things for the first time. When I arrive at a destination I’ve never visited before, I get to be new again. I’m seeing everything for the first time, finding my way around and making friends. I tend to float around in a sense of awe for the first day or two. It helps me remember: the past is irrelevant. 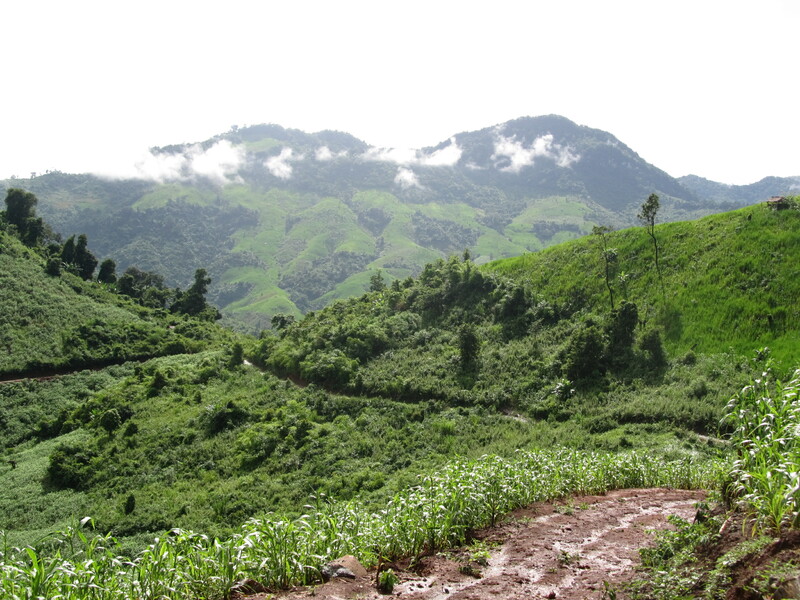 Hiking up a mountain in Laos to see this view was definitely a challenge. Although this might seem obvious, there are some people that seem to travel with their eyes closed. They might just be there for the parties in Asia or to lie on a nice beach every day and forget about reality. In my opinion, this isn’t really travel. Travel is supposed to open your eyes and broaden your mind. You should experience new things as often as possible and get as far from your comfort zone as you can. That means absorbing everything around you and learning everything you can from each place you visit. I use all long journies whilst travelling to reflect on where I’ve just been and what I found out while I was there (I’m revealing my inner-hippy here). For me, travel without education just isn’t travel.